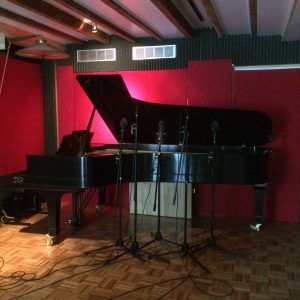 I spent a few afternoons in One Soul Studio this week recording a set of original solo-piano music. It’s a collaboration with my sister, Loryn Spangler-Jones. Loryn is a visual artist and we decided to create a body of work by drawing inspiration from each others’ work – I created music inspired by new pieces of her art, and she is creating art inspired by pieces of my new music. Together we’ll have a new body of work that is somehow connected. It’s been a really exciting, fun and challenging collaboration!